SYMPHOBIA is everything you have been missing in your orchestral palette: immersive ensemble multi-samples attained by true ensemble recordings and intense cinematic effects, all available in a rich selection of combinations and articulations. With SYMPHOBIA, you have at your disposal the most inspiring orchestral tool for scoring film, games and television. SYMPHOBIA is not your traditional orchestral sample library. Instead of focusing on individual instrument multi-samples, SYMPHOBIA offers ensemble multi-samples in various orchestrations and orchestral groups. These playable ensembles cover different sections and groups from the orchestra as well as the entire orchestra playing together. The reason is simple: the real thing sounds so much better. A staccato note played by violins, violas, horns and trumpets, together, correctly seated at the concert stage, will sound much more cohesive than a mixture of individual sample recordings of these four elements. Another example of the SYMPHOBIA concept is the low strings patch, which has been recorded with celli and basses playing in octaves. This makes SYMPHOBIA the ideal tool for creating big, realistic sounding orchestral arrangements and orchestrations. In addition, a number of individual instrument articulations are available, such as violin section flageolets and horn section marcatos. 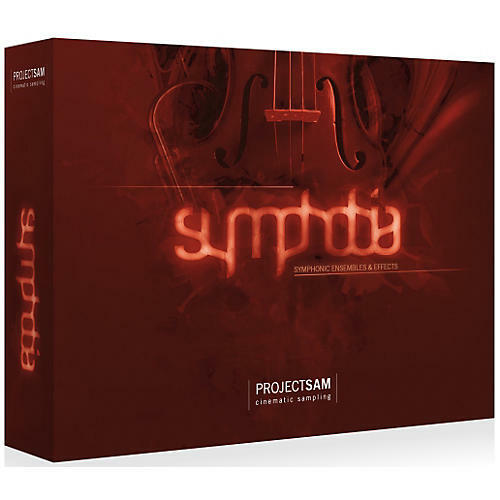 SYMPHOBIA introduces a brand new instrument group for ProjectSAM: the string ensemble, recorded in a warm concert hall. An extensive Ensemble bank and a unique Effects bank are available. The Ensemble bank includes numerous full-string articulations, including tremolo, staccato, pizzicato and con sordino. Other highlights in the collection feature beautiful chord performances and low strings playing in octaves. The Effects bank includes a wide range of upward and downward glissandi, shrieky clusters, stabs and wild arco/pizzicato textures -- priceless material for film and TV composers and impossible to achieve using standard multi-samples. The brass sounds in SYMPHOBIA are all-new recordings. The Brass Section in SYMPHOBIA offers a full-brass ensemble in a number of articulations, including sustain, marcato, staccato and mutes. Also available are major & minor chord performances, different orchestrations of mixed brass instruments and, similar to the strings, low brass in octaves, with the tuba playing an octave below the trombones. The Effects range from several types of horrific clusters to note bendings, horn rips and wild repetitions. SYMPHOBIA offers full-woodwind ensemble samples that include the following instruments: flute/oboe/clarinet/bassoon/bass clarinet/contra bassoon. Apart from the vibrato and non-vibrato sustains, portatos and staccatos, octave runs are available, as well as flute piccolo effects, clusters, slap notes, wild phrases and multi-phonics. One of SYMPHOBIA's highlights is the performance by strings and brass together. Nothing beats the live, natural blending of sections in a real concert hall. SYMPHOBIA offers powerful sustains, staccatos and other articulations played by violins, violas, celli, contrabasses, horns, trumpets, trombones and tuba playing together in different orchestration variations. Numerous special effects are available, combining different playing techniques and dynamic arcs like arco, tremolo, flageolet for strings and open, muted and flatter-tongue for brass. Last but not least, the Effects bank houses the Glissandi Rips, played by the same powerful combination of sections. In addition to the large symphonic sections, SYMPHOBIA also offers a solo string quintet, consisting of 2 violins, 1 viola, 1 cello and 1 contrabass. As with the other ensembles, the solo strings are spread out over one full keyboard. Massive orchestral impact! That's the best way to describe the contents in this bank. Full-orchestra stabs, rips, dark textures and trailer risers are included, ranging from huge staccato hits to 15-second crescendos. You won't easily find orchestral effects more intense than these. Dystopia Volume Two: the dark side of SAM, featuring ambiences, textures, pads and effects created by processing and tweaking the SYMPHOBIA recordings. An extremely inspiring addition to the acoustic string, brass and woodwind instruments found in this library, covering pads, spheres and percussive sounds. SYMPHOBIA covers instruments that go beyond the traditional symphonic range. Over 120 beautifully performed ethnic flute phrases are included, covering duduk, shakuhachi and Native American flute. Some phrases are atonal or effect-like; others are performed in a specific key. SYMPHOBIA without adult supervision! What do you get when you layer SYMPHOBIA's unique recordings into massive combinations? Find out in the Multis section -- a selection of inspiring, stylized program combinations, layering ensembles, effects and articulations together, and creating ready-to-go combos for different musical genres. The naming of each Multi will give you a good clue about its typical use. A few examples: "Acid For Blood", "Chainsaw Attack", "Cat 'n Mouse" and "City Noir". There are currently 40 Multis to explore, and more are added with each Symphobia update. SYMPHOBIA is formatted for Kontakt 4.2.4 and cannot be loaded into earlier versions of Kontakt. Kontakt 4.2.4 requires an Intel Mac or Windows PC. PowerPC Macs are not supported! Kontakt Player 5 can be downloaded from the Native Instruments or from your ProjectSAM account page.